Now that your house has been set on its foundation, the manufacturer’s job is over. It’s up to your GC to finish the task, a process known as “buttoning up.” The term comes from the old days of modular homes when different parts of a house were literally just snapped together. This term is still used, but it’s a significant over-simplification. There is still much work to be done before your house is move-in ready. The different modules do still have to be fastened together, but now the process is accomplished in much more structurally sound ways. The modules already come with plumbing and wiring installed, but they must be connected to each other. Your GC will have to hire electricians, plumbers, and other specialists to make sure that the utilities are properly connected throughout the house. Drywall may crack slightly during shipping and setting. This is completely normal and does not indicate any structural problems. Cracks can easily be covered up and painted over. 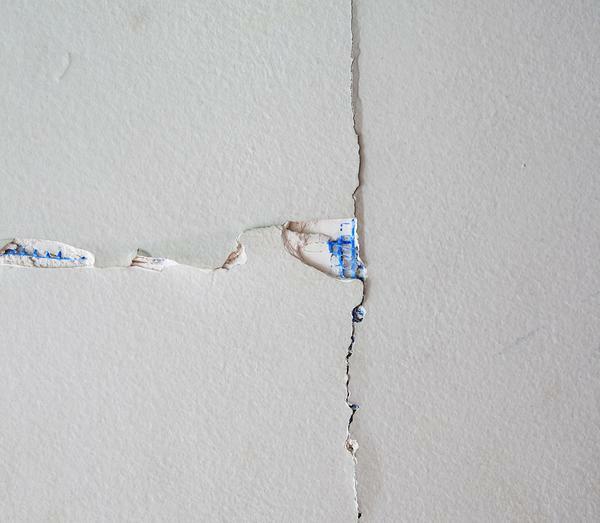 During transport and delivery, cracks and dents may form in the drywall. This does not have any effect on the structural integrity of the house, but those cracks will need to be covered up with grout and a fresh coat of paint. Far less common, but still possible, is that damage to cabinetry or other interior aspects may occur. In that case, your GC can let you know whether or not it can be fixed on site, or if the manufacturer should ship a replacement. Consider that it may be less expensive (and faster) to buy a replacement locally. Any interior aspects that are attached to the house like sinks, showers, and dishwashers will already be set in the modules, but appliances like refrigerators and washer/dryers may have to be installed by your GC. Items like these will be shipped together from the manufacturer and will need to be signed for. Look over your inventory closely! If you acknowledge receipt of an item without making sure that you actually received it, you may be on the hook for the cost of purchasing it all over again. At the very least, it will cause delays and headaches. You may have decided to let your GC finish some rooms or aspects of the house rather than having it done by the manufacturer. Some areas like basements and porches will need to be finished by the GC regardless of your preference since it isn’t possible to have them constructed by the manufacturer ahead of time. These projects will usually be started after the other buttoning up has been completed.